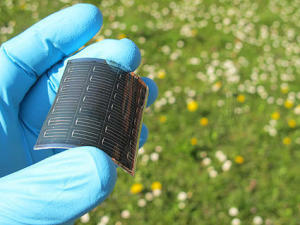 Flexible thin film CIGS solar cell on polymer substrate developed at Empa. It’s been hard to feel particularly positive about the state, and future, of the planet over the past few days. Record global CO2 emissions, after a fall during the recession. Germany easing back on nuclear power. Ongoing climate change denial among the crazy right in the US. And in the UK, a huge number of column inches for the climate change minister, not because of the ambitious carbon reduction targets he announced last month, but because of his alleged misdemeanours. Finally (though probably not) there’s the growing mobilisation against onshore wind turbines in Britain, most recently in mid Wales. Yet here we have Mark M. Little, global research director for General Electric boldly predicting that solar power may be cheaper than electricity generated by fossil fuels and nuclear reactors within three to five years, because of innovations. GE’s Mark M. Little told Bloomberg in an interview that if the price could come down to 15 cents a kilowatt-hour or lower, “which I’m hopeful that we will do”, it would be cheaper than energy from carbon sources – principally oil, gas and coal– in some US states.. The 2009 average US retail rate per kilowatt-hour for electricity ranges from 6.1 cents in to 18.1 cents. GE said in April it had boosted the efficiency (the amount of sunlight converted to electricity on the latest thin-film solar panels) to 12.8 percent. The thin-film panels will be manufactured at a plant that GE intends to open in 2013. The cost of solar cells, the main component in standard flat solar panels, has fallen 21 percent so far this year, and the cost of solar power is now about the same as the rate utilities charge for conventional power in the sunniest parts of California, Italy and Turkey according to London-based research company Bloomberg New Energy Finance. Standard solar panels use silicon-based photovoltaic cells to transform sunlight into electricity. The thin-film versions, made of glass or other material coated with cadmium telluride or copper indium gallium selenide alloys, account for about 15 percent of the $28 billion in worldwide solar-panel sales. Meanwhile, this week (June 1, 2011) scientists at Empa, the Swiss Federal Laboratories for Materials Science and Technology, achieved a light-conversion efficiency of 18.7 percent, a new world record, on flexible solar cells made of of copper indium gallium selenide (CIGS). Scientists have been trying for years to develop a low-cost solar cell, which is highly efficient, easy to manufacture and has high throughput. According to Ayodhya N. Tiwari, who leads the team at Empa’s Laboratory for Thin Film and Photovoltaics, flexible and lightweight solar cells with the new efficiency ratings could bring about a “paradigm shift and usher in low-cost solar electricity in the near future. Flexible cells like these can be manufactured by “printing” them with a roll-to-roll process, further reducing their cost. And because they are relatively light and flexible, they can be used in more places than the heavier and more rigid polycrystalline silicon cells used in flat panels. Previous PostBuying electric cars for staff use, councils could slash costs	Next PostCar plant to generate enough solar power to make 7000 cars a year.